The Fellowship was fortunate enough to obtain a copy of WELCOME BACK #1 from BOOM! Studios. Christopher Sebela writes, Jonathan Brandon Sawyer draws and Carlos Zamudio colors. Mali is 26 and isn’t really going anywhere. She can’t find a job, her boyfriend dumped her, and she can’t escape her past (her stepdad’s past, anyway). What she doesn’t know is that she’s a “sequel” and that means that she’s fighting a never-ending war. One blow to the head later, she starts to remember, and learns that she has a lot of catching up to do. Lucky for her, the first thing she remembers is how to fight. And the fight scenes in this book are very cool. They also fit in beautifully with the cut scenes of Tessa, but no spoilers on that. One of the main story elements is the sadness that comes with being a sequel, and I found myself hoping that Mali’s story overcomes that. The art really brings a sense of the past merging with the present; the history spreads are just as gripping as those fight scenes. This first issue sets up the title so that we’ll get to learn about Mali and the sequels as Mali learns about herself. It’s a great start to a history-spanning epic. 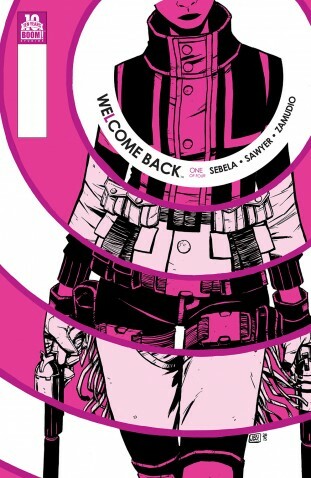 WELCOME BACK #1 is available now at your FLCS or at boom-studios.com.